My first experience with elephant garlic was eating oven-roasted cloves that we smashed onto my Grandma’s homemade bread. Talk about a taste explosion. Accompanied by a blackberry shake and that is the stuff a happy childhood is made of. 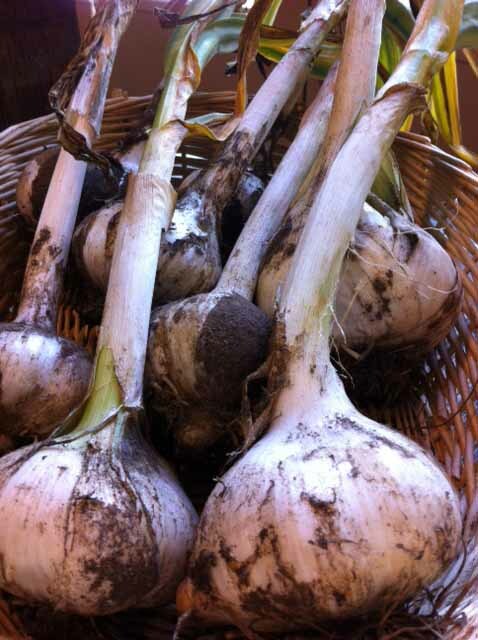 John brought up the first harvest of elephant garlic from the 21 Acres Farm to the Market. If you were one of the lucky few to buy the garlic scapes from these plants last month you have some idea of how big the heads are. Actually a relative of the leek, elephant garlic is milder than traditional garlic and tastes great raw or cooked. We are curing (drying for storage) some of the garlic out back and will be saving some of the cloves for planting this fall. Most importantly, the green garlic is ready to go and in the Market now. Being a new product on the Farm, the issue of pricing always comes up. Economic realities certainly weigh in on how we price our goods. At 21 Acres, however, we always look at the actual cost for the farmer to grow food. Sustainable farming is much more than sustaining the earth; it must also mean sustaining a farmer and his or her family. Among the variables we consider are the cost of the seed, organic soil used for starting seeds, farm labor and of course, quality of the product. Stop by in the next several weeks to see the elephant garlic and possibly smash some for yourself into our 21 Acres bread. Believe me, your tastebuds will not be disappointed. PS. Also, think about making your own blackberry shake with our Fresh Breeze milk…yum! Note: This is an interesting exchange we had with Farmer John this past week regarding drying garlic: Every farmer has his/her own best way(s) to produce his/her perfect product. I wrote “hang dry” in my previous email, which is most commonly used for curing garlic. But, the protocol doesn’t matter…..as long as the garlic is cured without being affected by direct sunlight and/or moisture….which leads to greening/rot. In our case, we use one of our wash station tables which is “netted with wire” and which provides perfect ventilation. We lay garlics on the netted table under the big tree which provides shade and hopefully no rainfalls next week or two!? For most people, hanging or air dry would be an easy way to cure, particularly this summer as it is very warm, with intense sun. Please tell customers that our elephant garlic is not cured at this point. Tell customers to cure for storage…..hang dry with good air circulation, 1 – 2 wks. Shake off dirt, trim top/roots after curing.